Join us for two days of exploring and learning about the fascinating features of glacier ice, the amazing dynamic force that has shaped so much of Alaska's landscape. We'll spend one day investigating the surface of the Root Glacier, exploring how glacier ice forms and how it melts, pondering features like crevasses and moulins, and learning the exciting answer to the question: where does all that meltwater go? On the second day, we'll imagine what it might look like within and underneath a glacier, and imagine what happens when a glacier retreats. What will Alaska's glaciated regions look like decades from now? Our instructors Joanna Young and Aurora Roth team up with an experienced mountaineering guide to offer two days of unforgettable learning and adventure. 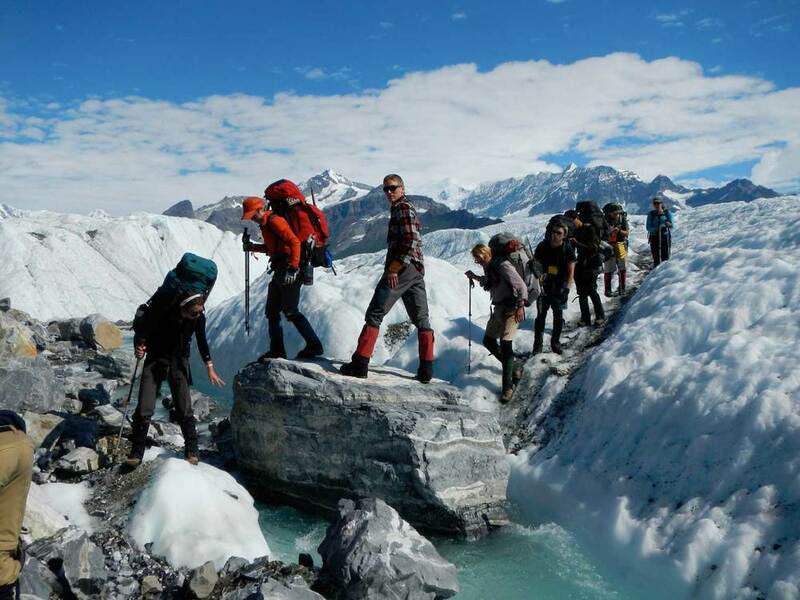 Participants need not have any former experience on glaciers, but should be able to hike 5-7 miles in one day over uneven terrain. Joanna Young is a PhD student in Geophysics at the University of Alaska Fairbanks (UAF), where she studies the glaciers of Alaska to determine how they are losing mass in a changing climate. She has been exploring the glaciated part of the Alaska playground for 6 years, with field studies on the Juneau Icefield, the remote glaciers of the Hayes Range, the coastal icefields of Yakutat, and even halfway up Mount McKinley. Before beginning her PhD, Joanna also obtained a Masters in Geophysics at UAF, and before that a BS in Astrophysics and a BA in Philosophy of Science at the University of British Columbia. She also spends a great deal of her time on education and outreach; she has given public lectures in Denali National Park, has been interviewed for news stories and documentary films, and is a co-director of Girls on Ice Alaska, a backcountry science and mountaineering program for high school girls. Aurora Roth is a PhD student in Geophysics at the UAF. She uses computer models to explore the future changes of glaciers in Alaska and the consequences of these changes on river runoff and sea level rise. She is also interested in the surprising ways that glaciers contribute to river and fjord ecology. Growing up in Fairbanks and Girdwood, the landscapes of Alaska have been a continuous source of inspiration that have shaped her as a scientist and artist. She has followed her passion for glaciers, mountain landscapes, and high latitude communities to Iceland and Patagonia. She recently returned from Svalbard, Norway where she did her best to not encounter any polar bears and or get stuck in ice caves. Additionally, Aurora is a student in the Resilience and Adaptation Program (RAP), which aims to foster interdisciplinary understanding of sustainability issues in the North in times of rapid change. Before beginning her PhD adventure, she obtained a BA in Physics from Carleton College in Northfield, Minnesota, and afterward she spent time teaching at Coastal Studies for Girls in Freeport, Maine and at Montana Outdoor Science School in Bozeman, Montana. Schedule: Participants should plan to arrive in McCarthy by 5 p.m. in time to get settled and enjoy dinner on Friday, August 19th. Dinner will be followed by a short lecture or activity. Saturday and Sunday will be spent in the field exploring glacial and periglacial environments. The workshop ends late afternoon Sunday, August 21th. Meals and Accommodations: Lunch and dinner will be provided and shared communally; workshop participants are responsible for the breakfast meal. Breakfast can be purchased from a limited number of local vendors or participants can bring breakfast provisions to store and cook in the Hardware Store facilities. Hot water will be provided for coffee and tea. Every effort will be made to accommodate dietary needs and restrictions with advanced notice. Primitive camping is available at no cost to workshop participants. The private site is located just a short walk away from the Wrangell Mountains Center campus. Those who camp are welcome to store gear and food, borrow bear barrels, and use our rustic shower and other facilities at the Hardware Store. WMC staff will direct you to the campsite and orient you there upon your arrival.